I recently ordered a couple of items. I live in regional Vic & received the order in under a week, so couldn't be happier with your service. If I need more I'd happily buy from you again & will refer friends to Cable Chick. A low cost, reliable USB cable for all your data and charging needs. Avencore Crystal Series USB 2.0 High-Speed cables deliver exceptional data and power performance in an understated and professionally-styled cable that's at home on any computer desk and in any laptop bag. Micro-USB 5-Pin connections have become so common, its hard to imagine life without these handy little plugs. Whether they help you load music and photos onto your phone or charge your headphones and wearable tech, they're an important part of your life. 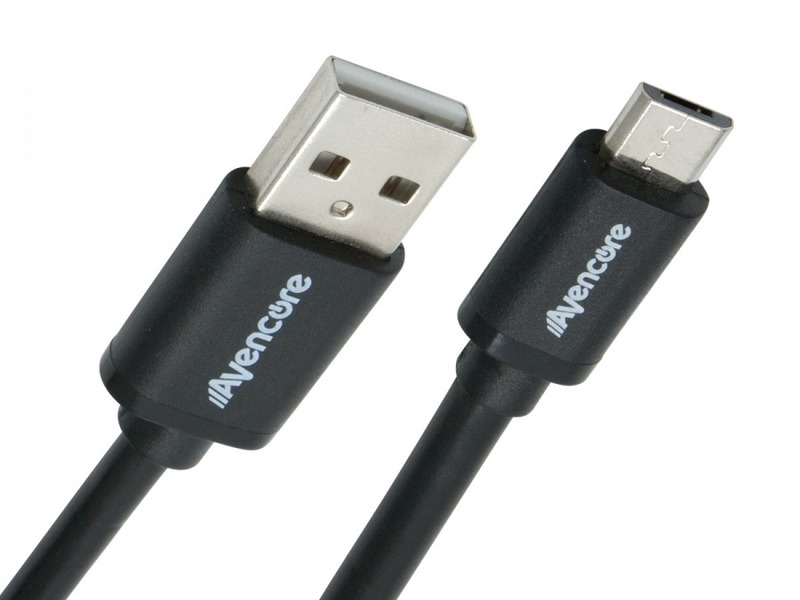 The Crystal Series by Avencore introduces a wide range of USB 2.0 cables, each one featuring fully moulded plugs and PVC jaketing over 99.9% oxygen-free copper cores. With a 22/28AWG rating, they'll go just as fast as your hardware will allow, while shorter lengths can accomodate fast-charging, high-power devices as well. Cable Chick Tip: Not all current mobile phones and cameras have Micro-B 5 Pin USB ports, so check your device manual for compatibility before purchase. Some manufacturers even have their own unique cable versions which may not be compatible with the Micro-USB standard shown here. Answer: "Yes, our Avencore Micro USB Cables will work great for that." Avencore Crystal Series Micro USB 2.0 cables are the best companion to you smartphone, tablet, wearable tech and other compact gadgets which need quick charging and/or data sync. This high quality USB 2.0 Type-A Male to Micro-B USB Cable always comes in handy - plus the short 1m length makes it ideal for travel!